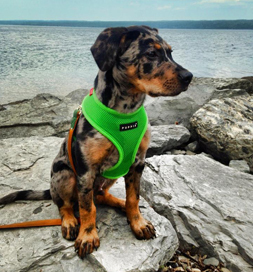 Jamie Fultz and Peter Herzeellle knew exactly the kind of dog they wanted to adopt: a Catahoula Leopard Dog. But they soon found they weren’t the only ones. They repeatedly missed out. One time they made an eight-hour drive, leaving home at three a.m. so they would be first in line. Turns out they weren’t and once again missed out. Read Raleigh’s story in Jamie’s words. They persisted, however, and a few weeks later they were rewarded. They spotted a Catahoula pup on Petfinder. He and his family had been wandering the streets when a man rescued them and turned them over to Paws and Claws Rescue in Hot Springs, AR. Raleigh, as he is named, seemed perfect. The only problem was that he was in Arkansas and they lived in Dundee, NY. Nevertheless, they filled out a lengthy application and their references were checked out thoroughly. Their application was approved and Raleigh was to be theirs; distance was not a deal breaker. The rescue group arranged transport, and Jamie and Peter soon found themselves welcoming their new family member. One afternoon while Jamie thought Raleigh was napping, she heard a “thud thud thud.” Oh no, she thought, what has he gotten into now. As it turned out, he indeed was napping but was wagging his tail in his sleep. It resounded heavily as it hit the floor. Sounds as if he’s one happy boy with dreams filled with good things. Surely having his own forever family is part of Raleigh’s good dream.